Ready to play those cymbals? Make sure the elastic is the right width: (for double-slot cymbals) the elastic should fit the slot exactly. Measure the slot before you purchase the elastic. Lay the cymbals flat on a table. Use colored nail polish to mark on either both the thumb cymbals OR both the middle-finger cymbals; and make the marks large enough to see at a glance (so you can pick them up and put them on quickly). Let it dry. Have your needle and thread ready (I use waxed dental floss); fit the cymbal onto either the thumb or middle finger, (according to the way you marked it with the nail polish). The elastic should be between the edge of your nail and your first knuckle - pull it tight on the inside, tight enough so it won't fall off. Hold the ends of the elastic just at the place where the two ends comes through the cymbal, and slide it off your finger without letting go. Start sewing. You can pull up the slack to make it easier, just don't lose your place on the elastic where you want to sew it. Usually, after I get in the first few stitches across the width, I trim the ends back to about 1/4", and overhand-stitch the ends together. And I always finish up with "Fray-chek" or white craft glue on the knot and even the cut ends of the elastic. I NEVER sew on buttons, beads, or use different colored thread to tell which finger the cymbal is supposed to go on. WHY? Because I don't want extra stuff (and weight) sewn onto my cymbals; and nail polish is so much easier to see than thread when you're quickly putting your cymbals on. Take a tip from a Pro! When you have your cymbals on, they should be tight enough to stay put when you move your hands/arms around. Since your fingers will probably start turning blue after a few minutes, don't keep them on over 15 minutes at a time, max. 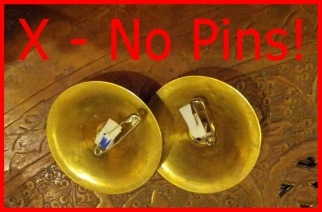 Read even more tips on Finger Cymbals for belly dancers. Free lessons: "How to" VIDEOS from my underground belly dance studio to help you learn to play!